Guided Systems past programs include service to DoD customers in the rotorcraft engineering disciplines, as well as research and development in the areas of adaptive guidance and control, adaptive estimation, optimal path generation, and special purpose guidance law development. 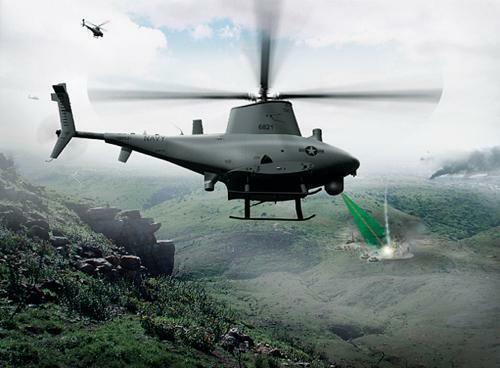 Guided Systems has also served on several occasions as a systems integrator, and has provided field operations and testing for a number of rotary wing UAVs. A sampling of relevant technology maturation and rotorcraft flight programs is included below. In its early years, Guided Systems performed a number of engineering studies for the Naval Air Systems Command and the Marine Corps AH-1W Cobra Helicopter Program Office. These included a full analysis of the performance benefits and life cycle cost of a four-bladed rotor system for the Cobra proposed by manufacturer Bell Helicopter. Guided Systems also completed conceptual redesign of the AH-1W’s stubwing to address problems of fatigue life, and to introduce air-to-air mission capability. However, the company quickly became focused on advancing the state-of-the-art in control system design and development, with special emphasis on adaptive methods and rotorcraft. Under the U.S. Air Force RESTORE program, GST developed and integrated a neural network-based nonlinear adaptive control system for a tailless fighter configuration under subcontract to Boeing. This architecture provided the ability to overcome flight critical failures and battle damage through ‘effective’ reconfiguration of remaining redundant control system resources in real-time via neural network adaptation. 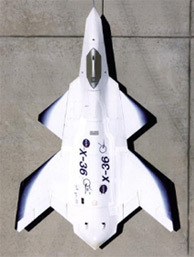 Technical maturity was demonstrated by the Boeing RESTORE team in piloted simulation and flight test on the NASA/Boeing X-36 experimental aircraft (pictured). GST has been awarded patent protection for this technology and has successfully transitioned this technology to the Boeing Phantom Works for use in a number of programs. This technology was also included as part of the winning Boeing Unmanned Combat Air Vehicle design for DARPA and has been evaluated in simulation for the X45A and the X45C J-UCAS. 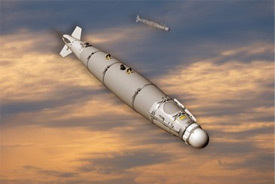 In a related SBIR program, a GST-led team that included Georgia Tech and Boeing designed a neural network-based adaptive autopilot for multiple variants of the Joint Direct Attack Munition (JDAM). To demonstrate its potential for cost savings, the adaptive autopilot design was carried out independent of wind tunnel and flight test aerodynamic data, then evaluated in flight-validated high-fidelity simulation. In the latter case, on-line learning was used to overcome the uncertainty in aerodynamic data. The GST team also first demonstrated the use of pseudo control hedging to integrate adaptive guidance and control loops, and to modify (i.e. hedge) trajectory commands to insure feasible path commands despite control saturation. The team also developed an overall system design that includes on-line modeling and real-time trajectory re-planning using advanced trajectory optimization methods, and demonstrated application of these technologies in high fidelity simulation of the X-33 single-state-to-orbit concept demonstrator (pictured above). Initial formulation and flight testing of neural network adaptive control for helicopters was performed under a Phase II SBIR from the US Army and NASA Langley for use on the Free Flight Rotorcraft Research Vehicle (FFRRV). The FFRRV, pictured at right, was designed as a modular test asset to flight validate Mach-scaled rotors free of the constraints of a wind tunnel. Thought it never matured to flight operations, Guided Systems completed design and development of miniature adaptive flight control hardware and software, and conducted flight testing on modified hobby helicopters in the period 1994 to 1997. Initial formulation and flight testing of neural network adaptive control for helicopters was performed under a Phase II SBIR from the US Army and NASA Langley for use on the Free Flight Rotorcraft Research Vehicle (FFRRV). The FFRRV, pictured at right, was designed as a modular test asset to flight validate Mach-scaled rotors free of the constraints of a wind tunnel. Thought it never matured to flight operations, Guided Systems completed design and development of miniature adaptive flight control hardware and software, and conducted flight testing on modified hobby helicopters in the period 1994 to 1997. During 1994 to 1996 Guided Systems developed and provided small helicopters fully integrated with traditional PID flight control and gimballed imaging equipment to Georgia Tech for the US Army Autonomous Scout Rotorcraft Testbed (ASRT) program, and conducted daily flight operations that were fully automated, including take-off and landing, on a routine basis for mock surveillance applications. One of the delivered ASRT helicopters is pictured at left. In 1998, Guided Systems and Georgia Tech partnered to field an advanced unmanned helicopter testbed based on the Yamaha R50 airframe, pictured here. Guided Systems was responsible for modeling and simulation, all avionics and simulation hardware and software, and flight operations. Using this testbed, the team demonstrated very high bandwidth (up to 10 radians per second) precision adaptive flight control with support from the US Army. Our adaptive control system technology was also used successfully in both helicopter and ducted fan operations by researchers at Georgia Tech as part of the DARPA Software Enabled Control program. In a Phase III SBIR follow-on activity, a variation of the autonomous guidance and control architecture developed for X-33 was matured for flight demonstration on the USAF Skytote UAV. GST performed this work in collaboration with AeroVironment, Inc., who manufactured the Skytote airframe. The contracted activity included full field support and all software test and validation responsibility. The Skytote takes off and lands vertically using a coaxial prop-rotor with true collective and cyclic controls, and transitions to a horizontal attitude for high-speed wing born flight. A 40% Scale Extra was set up by Guided Systems with the fully autonomous trajectory following control system developed for the Skytote UAV and employed as a surrogate testbed. This UAV was used to demonstrate successful adaptive transition between wing-borne and hovering flight using the Skytote avionics hardware and software, even though the airplane does not enjoy collective or cyclic pitch control. Guided Systems completed the design and simulation validation of an nonlinear adaptive guidance and control system for the Korean Aerospace Research Institute’s Smart UAV development effort. The vehicle configuration is that of a tiltrotor. The guidance and control system can be configured for either remotely piloted or fully autonomous flight operations, and provides seamless transition between helicopter and airplane modes of operations. A 40% scale model of the Smart UAV currently in piloted flight evaluations is pictured. Guided Systems is also actively engaged in the development, integration and/or operation of a variety of fixed-wing UAVs. For example, a fixed-wing UAV was developed in collaboration with a local designer for the USAF and is being used in flight tests of controlled active vision systems. The aircraft features a 50 pound payload capability for avionics and sensor, 3 hours endurance with the standard fuel tank. First flight flight was in February of 2006. Guided Systems also has several low-cost fixed-wing UAVs outfitted with camera systems and used to perform flight validation of vision-based guidance research. Guided Systems achieved first flight of the Eagle Aviation Technologies, Inc. Alpha Eagle coaxial unmanned helicopter (500 pounds gross weight) in early 2007. Very low cost of production is achieved in this vehicle through simplicity of mechanical design (belt drive, fixed pitch blades, longitudinal and lateral control via shaft tilt). Guided Systems was responsible for system integration and initial flight operations.